World travel on your bucket list but not in your budget? I just read a fascinating book on how you can travel the world on the cheap, paying nothing at all for your lodging. It’s a new travel trend called Home Exchanges. 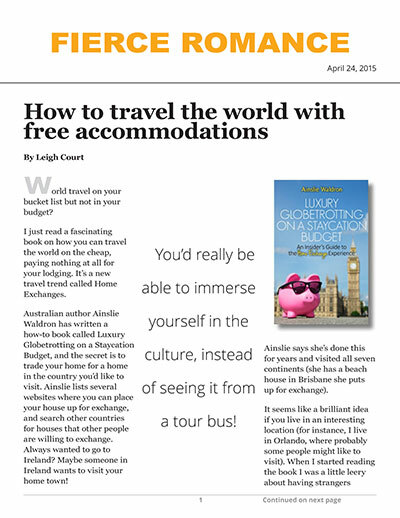 Australian author Ainslie Waldron has written a how-to book called Luxury Globetrotting on a Staycation Budget, and the secret is to trade your home for a home in the country you’d like to visit. Ainslie lists several websites where you can place your house up for exchange, and search other countries for houses that other people are willing to exchange. Always wanted to go to Ireland? Maybe someone in Ireland wants to visit your home town! Ainslie says she's done this for years and visited all seven continents (she has a beach house in Brisbane she puts up for exchange). It seems like a brilliant idea if you live in an interesting location (for instance, I live in Orlando, where probably some people might like to visit). When I started reading the book I was a little leery about having strangers sleeping in my house, but I guess these home exchange websites vet the people who participate, so there’s little problem and rarely any theft. (Basic advice is to keep your valuables in a locked room in your home when you leave or in your bank safety deposit box.) And there’s a ‘comment’ section on the home exchange websites where you can read about other peoples’ visits to a particular home you might be interested in. Like I said, it’s a fascinating concept. Imagine living like a local in Tuscany or Greece or Paris. Buying fruit for breakfast at the local grocery store, hanging out at the neighborhood café or using your new house as a home base to leisurely explore the surrounding area. You’d really be able to immerse yourself in the culture, instead of seeing it from a tour bus! My husband is ready to pack his suitcase, but I’m still trying to decide where I’d like to go. Hmm… Ainslie’s beach house in Brisbane sounds awesome. I wonder if she’d like to trade for a house close to Walt Disney World?